Cold winter weather invites the warm spicy flavors of cinnamon, clove and nutmeg. Apples and their cider provide the perfect medium for bringing those flavors to the palate. Spiced mashed apples make excellent sauces and butters, delicious eaten on their own or used to compliment the flavors and textures of both sweet and savory dishes. Apple butter, the much thicker slow-cooked version of applesauce, is a tasty companion to cheese and bread and a nice counterpoint to rich, fatty pork. Apple-based sauces have been a part of the human culinary tradition for millennia. Apple butter, on the other hand, is decidedly American with origins in 18th century Pennsylvania and Appalachia. Apples are cooked and mashed and then cooked some more until they’re nearly as thick as paste. Seasonings include the classic sweet spices, some apple cider and perhaps a bit of apple brandy (obviously not included in the original Amish recipes). Once nice and thick, the butter can be water processed in mason jars and kept for months in the pantry. Apple butter is easy enough to make. We made a batch in October after we received a large shipment of apples and pears in our Capay produce box. We knew we couldn’t eat them fast enough to enjoy them at their best, so we opted for this simple form of preservation to extend their shelf-life. We mostly ate it on peanut butter sandwiches and cheddar cheese sandwiches, but it could have been used as a condiment with tender pork loin or as a topper to our muesli pancakes. We recently used up the remaining apple butter from a recent batch in a recipe for barley scones from Kim Boyce’s beautiful baking book, Good to the Grain. Instead of using strawberry preserves we used the apple butter along with some grated Irish cheddar cheese. They were perfectly sweet and savory. With the addition of crispy bacon and soft scrambled eggs, a cozy Sunday brunch at home brought our weekend to a delicious conclusion. 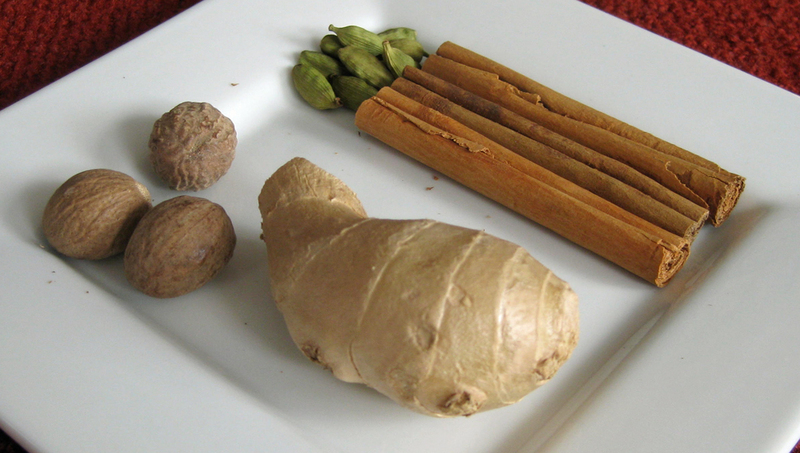 Spicy--fresh ginger, nutmeg, cardamom pods, and cinnamon sticks. Since we used up the last of the apple butter in these delicious barley flour scones before we’d accumulated enough fruit to make another batch, we were relieved when this weeks Capay produce box arrived full of apples and pears. We aren’t big sticklers for rigid adherence to a specific recipe. The technique for creating fruit butters is so universally applicable to things that “melt” and thicken that it seems silly sticking to one variety of apple or pear. Sticking to a particular variety of apple or pear may make the flavor of your fruit butter more consistent from batch to batch, but when your making such a small amount for your own personal use it’s nice to try an assortment of different apple and/or pear varieties. In the recipe below, we recommend using apple cider (we like to use hard cider). If you don’t have any, you can substitute a tablespoon of apple cider vinegar mixed with enough water to make up a half-cup of liquid. The resulting butter will be a bit more tart making it a nice side to savory dishes, like pork roast. 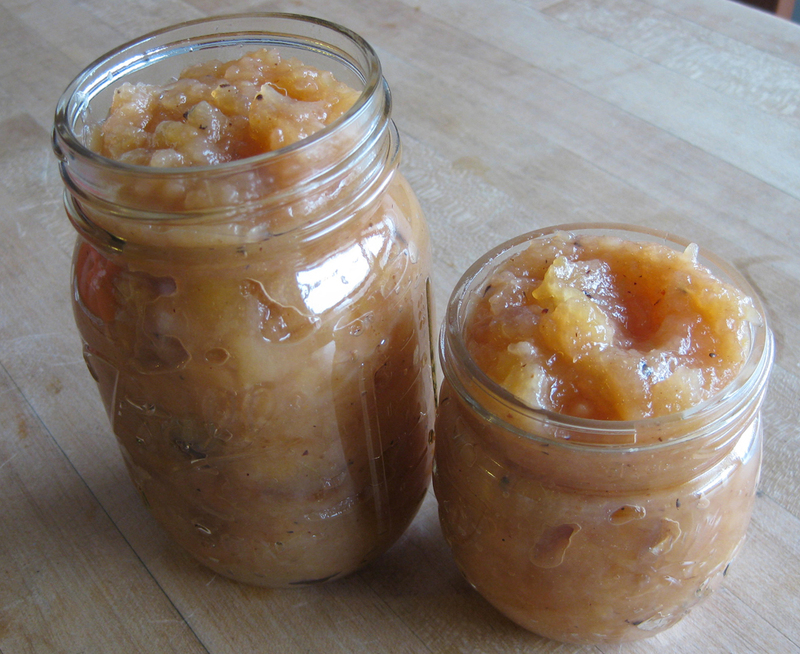 Jars of apple pear butter. YUM! Peel, core and large dice the apples and pears. Add to a medium size pot with the rest of the ingredients. Cook over medium heat stirring occasionally for 1 hour, being careful not to burn the fruit. Place the pot in the oven at 200 degrees for 8 hours or overnight. Can be stored in the fridge for a few months or canned to extend the shelf life. Preheat the oven to 350 degrees. Line a baking sheet with parchment paper or use a Silpat mat. Add the dry ingredients into a large bowl and whisk together to fully mix the flours. s, breaking it into smaller bits. Continue rubbing until the butter is in sizes ranging from rice grains to flattened peas. If the butter becomes too soft, place in the fridge for 10 minutes before continuing. In a small bowl, whisk together the buttermilk and egg until thoroughly combined. Pour the buttermilk and egg into the dry mixture, and mix until barely combined. The more you mix, the tougher the scone will be. Cover one disk with the cheddar cheese and top with apple butter. Top the spread with the other disk and press down gently so that the dough settles into the apple butter. Brush the dough lightly with melted butter and sprinkle with sugar. Use a sharp knife to slice the circle into 8 triangular wedges, like a pie. Carefully place the wedges on the baking sheet, leaving a few inches between them. Bake the scones for 22 to 26 minutes, rotating the sheets halfway through. The scones are ready when their tops are golden brown and some of the apple butter and cheese has bubbled over onto the pan. The scones are best eaten warm from the oven or later that same day. NOTE: If you can’t find barley flour feel free to substitute whole wheat flour or you can use all purpose flour for the full recipe. « Older Post Why wait? » Newer Post Gay pizza? How happy I was to stumble across your simple and straightforward recipe for the fruit butter! I was even happier to taste the results, once I tried it. I used only apples from my father’s prolific tree and I’m certain that the addition of pears would only elevate the flavor. SO delicious, with a nice depth of flavor from the spices. I am grateful that you included a substitution for apple cider and I am happy that the recipe is not crock pot based. Perfect for me. 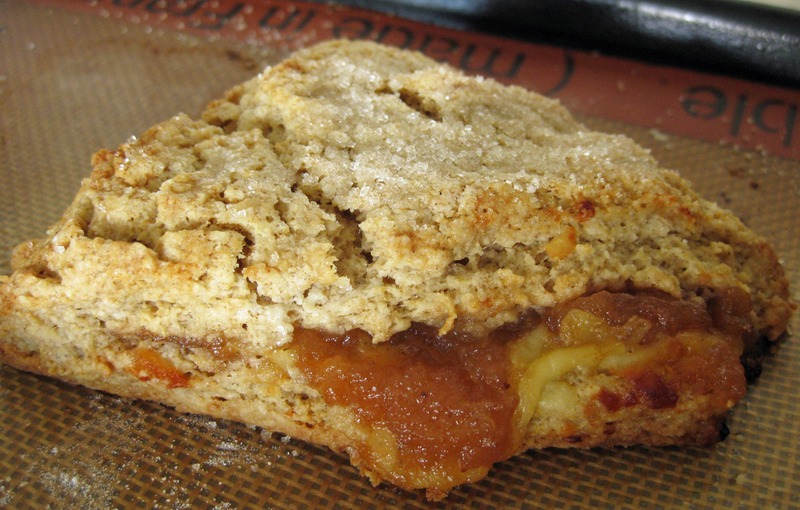 Thank you for posting the recipe (I look forward to trying the scone soon) – I will make the apple butter again and again. Thank you for this very kind comment, Liz! We’re delighted you found the recipe useful. We love fruit butters. They’re a terrific way to capture the bounty of summer in a form that says autumn every time we open a jar. As for the scone, we suspect you love it as we do.